It all comes down to this; possessions, secrets, lies, guilt and bloodshed all come to a head in episode 8’s season finale of Penny Dreadful. You might be surprised to know that all through the season I was planning on calling my Penny Dreadful finale review “Grand Guignol” what with it being a very appropriate term from the period, and then they go and call the final episode that anyway! After the last two weeks’ blood-soaked battle in the hold of a plague ship, and rather harrowing possession episode, one might expect this week’s episode to struggle to maintain the pace. This is far from the case however and after an almost interminably slow middle act, Penny Dreadful approaches its’ final hour with an almost wild abandon. Last week’s cliffhanger left our plucky bunch of protagonists with the knowledge of Mina’s whereabouts and the wherewithal to go and act. The game is very much afoot. Maybe he was reborn with it, maybe it’s Maybelline? Poor Caliban has had enough of being the literal man behind the curtain, and decides to declare his love for the young actress at the theatre. His attempts to make himself look more attractive (human?) backfire horribly, leave him looking laughable, and she rejects him. Sympathy for this devil rapidly evaporates asa he turns into a fedora-wearing “nice guy” and attempts to force himself on her. She fights him off and he’s fired from the theatre. The heartbroken monster returns to Victor’s lab and begs to be killed, unable to bear the pain of functioning in the world. Like all great monsters; he is crushed by the realisation he is as bad inside as his appearance suggests. Unexpectedly, the increasingly opium-addled Victor wavers and chooses not to shoot his creation. Likely out of guilt for creating him in the first place, but some part of him must still view this scientifically and see a chance to experiment further. Rory Kinnear has played Caliban well this season. In him, Penny Dreadful has a character who does terrible things (Van Helsing’s murder being a prime example) out of a desire to be loved. The Creature is a broken toy, unable to fix himself and lacks the ability to communicate without violence. So there’s smack-happy Victor deciding to help his horrific Pinocchio find love, when Ethan asks the young doctor to help with Ethan’s ailing beau, Brona. You might remember that she’s been suffering from the advancing stages of consumption all season, and I posited very early on that she was in line for the Frankenstein treatment. In a rather chilling moment, given the brotherly friendship they’ve formed, Victor sends Ethan out of the room for supplies and proceeds to smother the celtic cougher with a pillow. Upon Ethan’s return he is heartbroken to realise she’s gone and Victor helpfully offers to ensure the body is properly taken care of. Oh Penny Dreadful you’ve had some dark stuff this season and this is definitely right up there. Heartbroken, and trying to drown his sorrows, Mr Chandler is confronted by two Pinkerton detectives from the United States who want to take him back, in irons, to his father. They seem aware that Ethan ran from something but oblivious as to what. If only they’d seen the last 7 episodes they could have worked it out themselves and stocked up on silver bullets… Ethan slips their clutches once, but later in the hour, as a full moon rises, has little choice but to unleash his heartbreak and rage in the form of his bestial side. 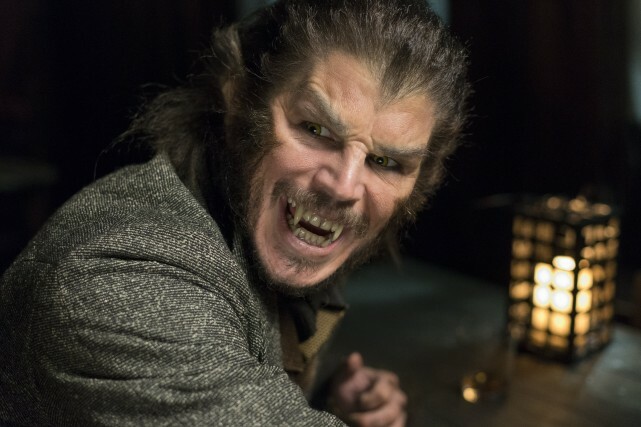 Yes, they finally confirm what we’ve all suspected sicne episode 2; Penny Dreadful‘s dashing gunfighter is a werewolf. The still below is seen for a second on screen, maybe next season will see a greater effects budget and a full transformation shown? I hope so, as I’ve always thought werewolves were a far better concept than vampires. Sir Malcolm finally gets his epiphany this week too, when he comes face to face with his lost daughter Mina. We’ve seen all season, through Olivia Llewellyn’s performance, a Mina who’s not quite the victim Sir Malcolm would like to believe. Here, at the last, we get confirmation that she has been corrupted beyond reasonable salvation. The showdown at the theatre sees yet more blonde succubus/acolytes/brides attacking the characters and getting dispatched in increasingly gruesome ways. the stoic and mysterious Sembene puts his knives to good use once more, Ethan shoots more than his fair share and Sir Malcolm comes face to face with the vampire from the plague ship. penny Dreadful has been very careful not to call him Dracula, so there remains the chance that this wasn’t Vlad, but one of his other servants. After all, you don’t kill the ultimate Big Bad at the end of the first season, do you? Much to my surprise, the biggest confrontation in the theatre is between Sir Malcolm and his daughter, rather than the vampire himself. Mina holds Vanessa and is about to kill her, taunting Sir Malcolm that his daughter is alive and well and in no need of rescue. Only last week, Sir Malcolm told Vanessa that he would sacrifice her to save Mina, if he had to. Timothy Dalton then delivers a line that could seem corny elsewhere but fits this moment perfectly; As he shoots Mina in the head, he tearfully says “I already have a daughter”. 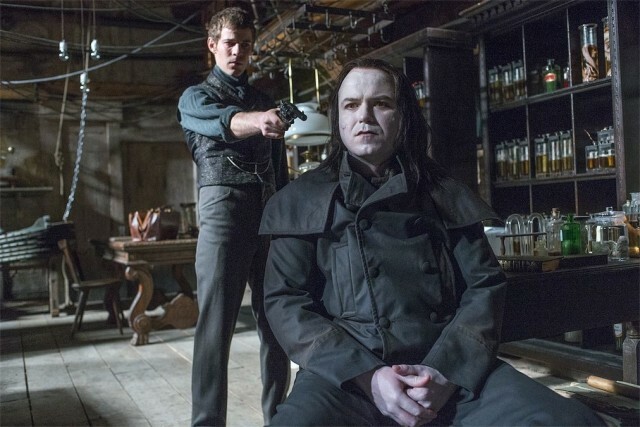 Had Penny Dreadful been a one season show, I’d feel rather cheated by the neat and slightly unsatisfying conclusion here, but witha renewal for next season already confirmed, the producers have a chance to lay groundwork for next years horror. The end of the episode shows us each of the characetrs dealing with the week’s events in one way or another. Ethan has the aforementioned fight with the Pinkertons while Victor begins work on his new project (Which is intensely horrible; this is his friend’s girlfriend. It feels more of a violation than if he’d just obtained a Jane Doe from somewhere). 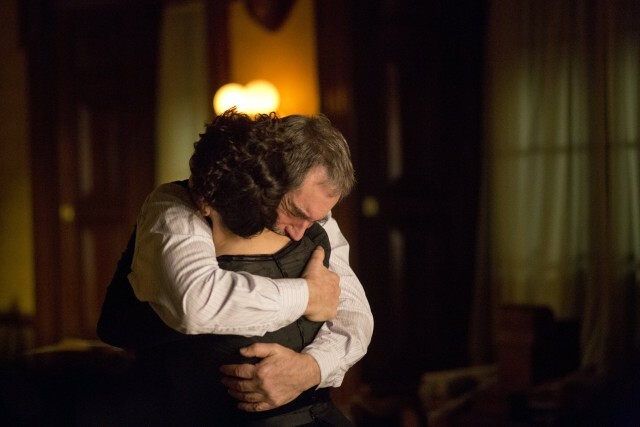 Sir Malcolm and Vanessa reconcile and the bereaved explorer finally lets himself cry for his lost children. Vanessa also visits a priest to discuss the possibility of exorcism. There’s a wonderfully meta line of “Do you want to be normal?” from the priest. 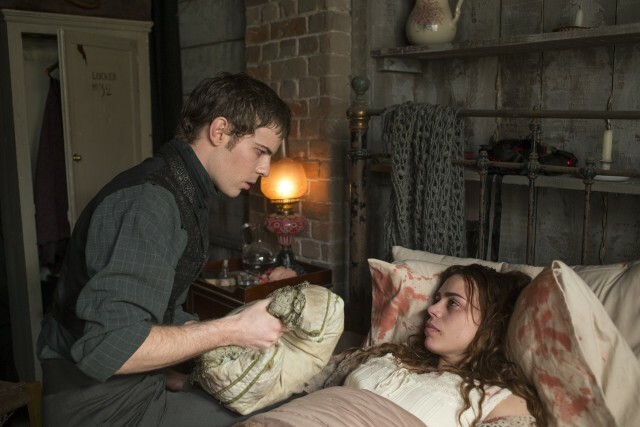 I don’t think anyone in Penny Dreadful could be normal byt society’s standards. Their very strange natures are exactly what brought them all together. Those of you who’ve followed my coverage of the show will doubtless be aware that my biggest bugbear with the show was the pacing but even now, when things are *finally* happening, I’m still not happy. For example; while I was pleased to read that Wilde’s immortal would be in Penny Dreadful, I feel disappointed with his use. His sole act of real significance was shattering Miss Ives control and letting the demon in. Dorian Gray served little purpose as a character, and more as a plot device; seducing his way round three of the cast and staring at his picture in fascination. The fact he has to deal with flat-out, polite, rejection from Vanessa might be the catalyst for his development next season. The untouchable, ageless libertine finds himself jaded with life, perhaps? Ethan’s story should prove interesting, as he got very much pushed to one side by the tale of Vanessa Ives and the voice in her head. Having spent the vast majority of the season’s middle third exploring Vanessa Ives’ past and rather disturbing present, the producers left themselves with increasingly reduced time to resolve the main plot and tie up loose ends. Ultimately, while there is some resolution to the matter of Mina Harker, nee Murray’s, dilemma much of what we’ve been watching is left up in the air. Given that Penny Dreadful has been renewed for a second season, one would hope that these plot thread left dangling are going to be picked up in the next season. Avoiding a sophomore slump shouldn’t be hard, after all they’ve still got a werewolf, at least one (possibly two) revenants, a drug-addled doctor, a possessed woman and an immortal. 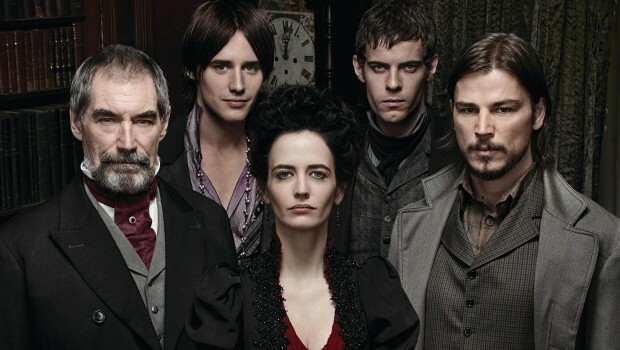 Penny Dreadful Season One MVP: It has to be Eva Green for her outstanding performance as Vanessa Ives, but I’d like to single out Timothy Dalton for appearing to have such fun with the role of Sir Malcolm Murray, especially his “Chicanery!” line in episode 6. Never has that word been said with such relish.